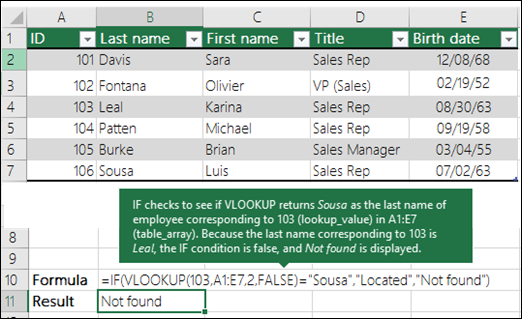 Use VLOOKUP, one of the lookup and reference functions, when you need to find things in a table or a range by row. For example, look up a price of an automotive part by the part number. 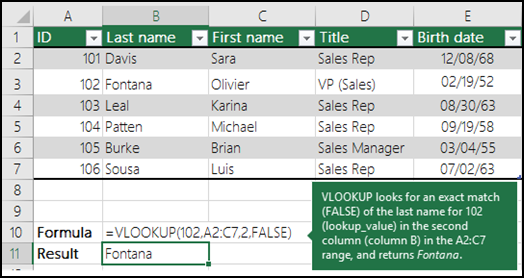 Tip: Check out these YouTube videos from Excel community experts for more help with VLOOKUP! =VLOOKUP(Value you want to look up, range where you want to lookup the value, the column number in the range containing the return value, Exact Match or Approximate Match – indicated as 0/FALSE or 1/TRUE). Tip: The secret to VLOOKUP is to organize your data so that the value you look up (Fruit) is to the left of the return value (Amount) you want to find. Use the VLOOKUP function to look up a value in a table. The value you want to look up. The value you want to look up must be in the first column of the range of cells you specify in table-array . For example, if table-array spans cells B2:D7, then your lookup_value must be in column B. See the graphic below. Lookup_value can be a value or a reference to a cell. The range of cells in which the VLOOKUP will search for the lookup_value and the return value. The first column in the cell range must contain the lookup_value (for example, Last Name in the picture below.) The cell range also needs to include the return value (for example, First Name in the graphic below) you want to find. Learn how to select ranges in a worksheet. The column number (starting with 1 for the left-most column of table-array) that contains the return value. TRUE assumes the first column in the table is sorted either numerically or alphabetically, and will then search for the closest value. This is the default method if you don't specify one. FALSE searches for the exact value in the first column. The value you want to look up, also called the lookup value. The range where the lookup value is located. Remember that the lookup value should always be in the first column in the range for VLOOKUP to work correctly. For example, if your lookup value is in cell C2 then your range should start with C.
The column number in the range that contains the return value. For example, if you specify B2: D11 as the range, you should count B as the first column, C as the second, and so on. Optionally, you can specify TRUE if you want an approximate match or FALSE if you want an exact match of the return value. If you don't specify anything, the default value will always be TRUE or approximate match. 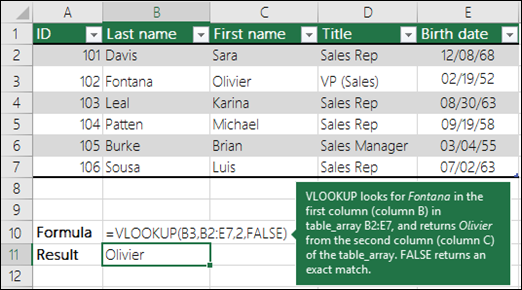 =VLOOKUP(lookup value, range containing the lookup value, the column number in the range containing the return value, optionally specify TRUE for approximate match or FALSE for an exact match). If range_lookup is TRUE or left out, the first column needs to be sorted alphabetically or numerically. If the first column isn't sorted, the return value might be something you don't expect. Either sort the first column, or use FALSE for an exact match. If range_lookup is TRUE, then if the value in the lookup_value is smaller than the smallest value in the first column of the table_array, you'll get the #N/A error value. If range_lookup is FALSE, the #N/A error value indicates that the exact number isn't found. 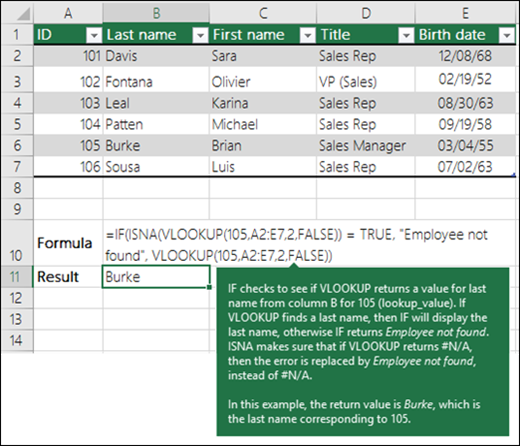 For more information on resolving #N/A errors in VLOOKUP, see How to correct a #N/A error in the VLOOKUP function. If col_index_num is greater than the number of columns in table-array, you'll get the #REF! error value. For more information on resolving #REF! errors in VLOOKUP, see How to correct a #REF! error. If the table_array is less than 1, you'll get the #VALUE! error value. For more information on resolving #VALUE! errors in VLOOKUP, see How to correct a #VALUE! error in the VLOOKUP function. The #NAME? error value usually means that the formula is missing quotes. To look up a person's name, make sure you use quotes around the name in the formula. For example, enter the name as "Fontana" in =VLOOKUP("Fontana",B2:E7,2,FALSE). For more information, see How to correct a #NAME! error. Using absolute references allows you to fill-down a formula so that it always looks at the same exact lookup range. Learn how to use absolute cell references. Don't store number or date values as text. When searching number or date values, be sure the data in the first column of table_array isn't stored as text values. 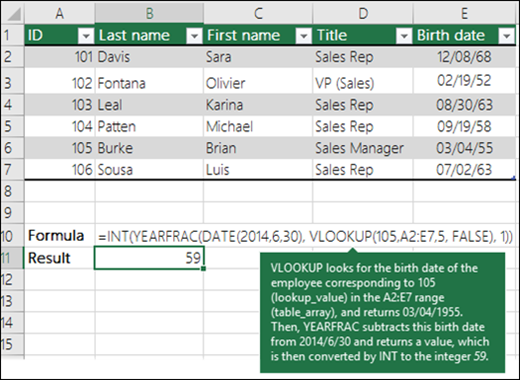 Otherwise, VLOOKUP might return an incorrect or unexpected value. Sort the first column of the table_array before using VLOOKUP when range_lookup is TRUE. If range_lookup is FALSE and lookup_value is text, you can use the wildcard characters—the question mark (?) and asterisk (*)—in lookup_value. A question mark matches any single character. An asterisk matches any sequence of characters. If you want to find an actual question mark or asterisk, type a tilde (~) in front of the character. For example, =VLOOKUP("Fontan? ",B2:E7,2,FALSE) will search for all instances of Fontana with a last letter that could vary. Make sure your data doesn't contain erroneous characters. When searching text values in the first column, make sure the data in the first column doesn't have leading spaces, trailing spaces, inconsistent use of straight ( ' or " ) and curly ( ‘ or “) quotation marks, or nonprinting characters. In these cases, VLOOKUP might return an unexpected value. To get accurate results, try using the CLEAN function or the TRIM function to remove trailing spaces after table values in a cell.